So, Danah and I (with the help of super-star April Snellings and the rest of the staff) got out our special section last night. I ended up having to pull off three days and nights of working until nearly midnight, which totally violates one of my goals for this year: To work way the hell less. And to not repeat another two-year streak with no vacation. But the section is done, we made good money, and since the guy in charge of all of our carriers hasn’t called me at home, that means the paper printed on time, everyone showed up, and it’s hitting news stands right about now. Not that any of this is the point of this post — I mean, you all don’t really care about the newspaper business, do you? No, the point of this post is finding an awesome writer friend! Because let me tell you, when you come home from having worked right at 40 hours in three days, and you haven’t eaten well, you’ve missed all of your gym time, and you’re on about four and a half hours sleep for the third consecutive day, do you know how much you’ll feel like writing? Let me see how to phrase this… Um… You f—ing won’t. Not even close. You’ll want to cry. Or binge eat. Or fall asleep immediately. But the one thing you won’t want to do — I can promise you — is write. Nope. Not even close. So, I cranked out 760 words last night because I had to. So the lesson is this: Find a great writer friend and cling onto them like there’s no tomorrow. Build them up when they’re down, rag them when they’re feeling a bit cocky, and challenge them to hit their respective goals faster. Best of all, if you find the right one, they’ll do the same. Stan: I’m trying to get motivated to write, but after three nights working, it’s very, very hard. I sit down and my body feels exhausted. I can’t even hold my abs in and the last thing I feel like doing after sitting in a chair for 14 hours at the office is sitting in the chair for another hour or so. April: I think you deserve a night off. And with that, I began mixing in some exercise and Kung Fu with… Writing. Why? Because I couldn’t let April down. April thinks I’m a superstar, and when you find someone besides your spouse who also believes in you, it provides just so much fuel and energy. You don’t have time for doubt because you know they could ditch you. So, I knew even in my exhaustion that April had been making great progress for three days, and if I were to fall short of the June deadline, I wondered if she’s ever set another one with me? Or would she find another writer friend who actually did push her? And it’s this dynamic that I encourage all my writer friends to seek out. Or, if you’re in a band, or making pottery, or whatever, you need to find that similar peer. Danah helped me get off the ground with my books a couple of years ago. She believed in me and pushed me and encouraged me day in and day out in the early days. But there comes a point where you think, “Well, she’s just saying that because she loves me.” And this is where I think a friend/peer helps you take it to the next level. Because believe me, I talk about writing so much that I think Danah wants to kill me sometimes… But, April? Not so much. P.P.S. 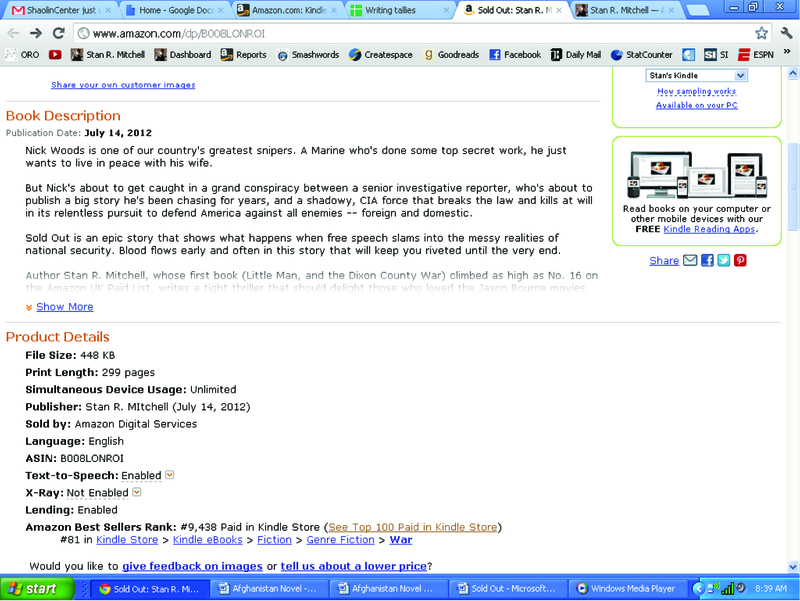 Thanks to all who continue to make my novels a success. I seriously couldn’t have done it with everyone’s support. Thanks to your help,, Little Man, and the Dixon County War has gone as high as No. 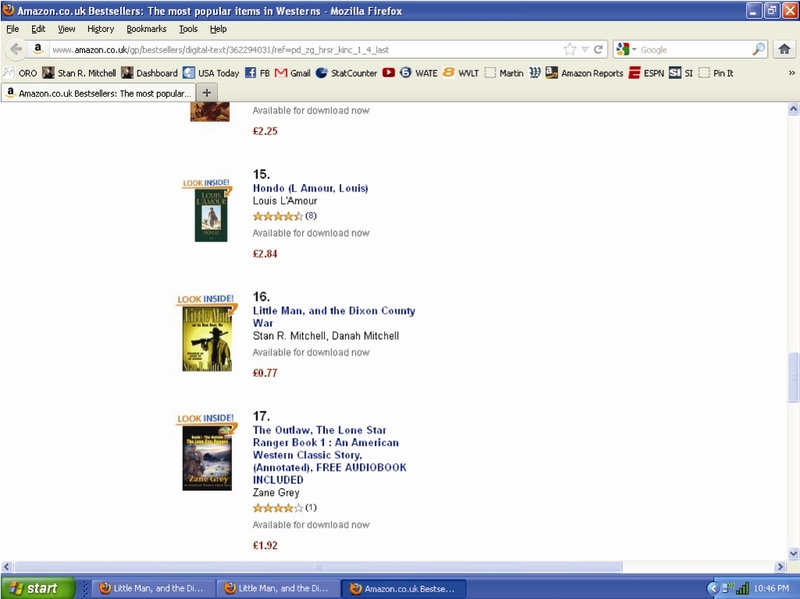 16 on the Amazon UK Paid List (see here and here)! 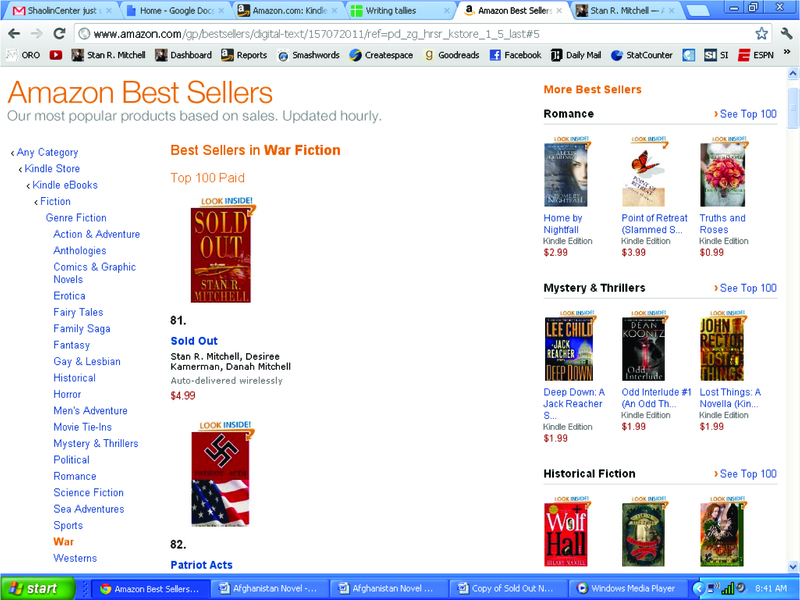 And my second novel, Sold Out, has also done well, going as high as No. 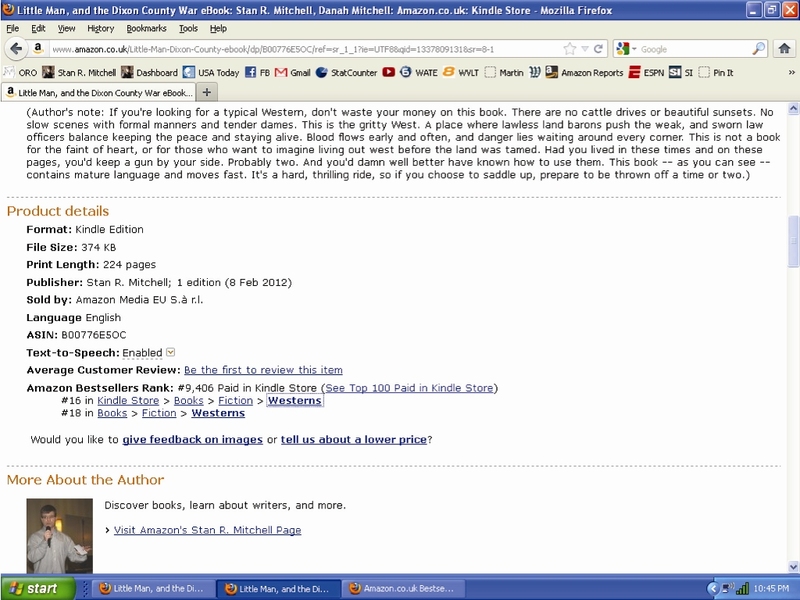 81 on the Amazon Paid List for the category of War (see here and here)! Thanks a million to my awesome friends, and if you’ve stumbled on my blog, you can learn more about both books here. I couldn’t agree more. Good writer friends are worth their weight in gold. Or maybe chocolate… Because if you had the gold, you could buy the chocolate, but you wouldn’t. But if you had that much chocolate given to you, then you’d have to eat it before it went bad. So, I guess I’m saying April rocks like a sleeping bag full of chocolate… And there aren’t many things I’d say were more valuable to me than a sleeping bag full of chocolate. Stan, you’re a rock star, plain and simple. The things that have happened to me in the last five years have been amazing, and you’re largely responsible. I pretty much owe you my career. I can’t wait to swap manuscripts in June! So I’m advised to get a writer friend who’ll give me lumps if I slump. OK, Stan, tag, you’re It. You’re a writer. You’re a friend. I need to get Chris Keever’s Chef/Restaurant thing out and I find myself stalling. So please bark at me.